It was inevitable, really. The largest crowd in the town’s history, the greatest collective football experience in the school’s history, Thanksgiving (NOT FRANKSGIVING!!!)? Attention was going to be diverted, things were going to be lost–important things, valuable things, personal things. But thanks to the eagle eyes of the API Plant Service, they were found, both in the stadium and on the joyfully trod grounds around it. 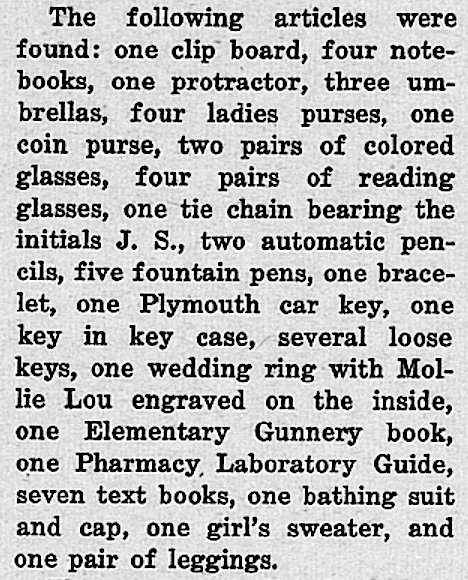 Here, published in the Plainsman after the 1939 Auburn-Florida game, is the first ever Jordan-Hare Stadium Lost and Found list, in case your Paw Paw is still looking for the keys to his Plymouth, or Mi-Maw is still wondering what happened to her leggings. Leather belt stamped with the name “Tootsie”, “Tattooing for Beginners” book, can of Vienna sausages, CSA belt buckle, empty Jim Beam bottle.